While most lawyers draft Wills, unfortunately (and it pains me to say this), not all of them do this well. This begs the question, what does a good estate lawyer do, and, how do I know if the person drafting my Will is any good? It is important to note that if you die without a Will you die intestate. Essentially this means that, since you fail to express your wishes, there can be no guarantee that your intended wishes will be carried out. Effectively dying without a Will leaves your estate open to the possibility that your despised Cousin Frank might get his hands on your assets. The best way to avoid this is to ensure that every adult has a valid and up to date Will. You will note that the words ‘valid’ and ‘up to date’ are underlined. Please understand that the best way to ensure that your Will is valid is to ensure that it is drafted by a legal professional. Using a DIY Will Kit is a risky move that too often results in a Will being declared invalid. In many instances, it can be even worse than dying intestate. 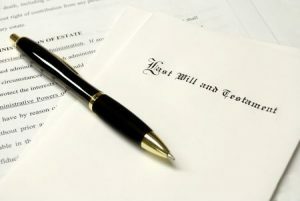 Of course, Wills, like many financial documents need to be reviewed (at least every 5 years) and certainly should be revisited following the death of a spouse or other significant beneficiary. So, you’ve made the decision to go and get your Will done by a solicitor. At this point it is critical to understand that even if you think your circumstances are simple they either aren’t, or there are things you hadn’t yet thought of that need to be considered to have an effective estate plan. While most lawyers draft Wills, few do it as their core means of business and consequently lack the skills and expertise to effectively negate issues arising from even the most common circumstances (divorce and blended families). Unfortunately, like everything in life, a little bit of knowledge and experience is everything. In estate planning, a lot of knowledge and experience means even more. There are nuances upon nuances upon nuances in estate planning. The landscape is ever changing, laws are changing and will drafting is complex at the best of times. The lawyer needs to know and intimately understand estate law, superannuation (and its regulations), taxation, family law, property law and company law – yes, that’s a lot isn’t it? So, do your own research, see if the lawyer has given any presentations on estate planning, they may have a reputation for this beyond their own circles. Ask around, or better still, call all those on your shortlist and ask us questions (not just how much!). When you are with the lawyer they will ask questions, lots of questions. If they are not asking questions, chances are you have a dud. Although you may think some of those questions are not relevant, they are…always. So, answer them honestly. Good questioning is the key to getting a great Will that will meet your needs now and in the future and awesome estate lawyers should be inquisitive by nature (how else are they to get to the bottom of any issue that may be the problem). Ask for a $99 Will and you can be guaranteed to get an inferior product. I know this because I know how much time goes into providing quality. Sorry, there are no short-cuts to quality. For more information about lawyers and fees click here. A thorough estate plan is perhaps the most important document you’ll sign. Most responsible adults think little of paying insurance on their house year after year just in case something happens? At some point you will die. While blunt, this is fact and emphasise the need for you to have a Will that is as thorough as possible. Look for Someone Prepared to Think Outside the Box. Be concerned If a lawyer cannot devise a solution to a problem suggests something like, “you should do it this way, it’s easier”. Both scenarios indicate that you are in trouble with a lawyer who is lacking expertise. Estate planning is all about problem solving and finding a solution. Great estate planners enjoy a challenge, in fact, we love them. An estate plan is not just a legal document. It must fulfil taxation objectives, real estate objectives, accounting and potentially business succession objectives. Most people have at least an accountant they see regularly. Many will also have a financial advisor or real estate agent they rely upon. It is imperative that your estate plan is devised in conjunction with other professionals as the best solutions arrive when all parties communicate and discuss your needs and goals. A Will prepared in isolation may do more harm than good. The Law is complex, estate planning is complex, there is a lot to get your head around. A good estate planning lawyer should be skilled enough to explain complex ideas and strategies to you simply so that you can consider the advice being given to you and provide your instructions accordingly. As with anything in life, those that know their job inside and out can explain things better than those that don’t.